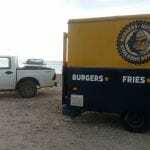 Mobile Catering Keeps Bonaire’s Beaches Natural. Many of Bonaire’s beach areas are still in their natural state, which most visitors, as well as residents, appreciate. But that doesn’t mean we want to go hungry while enjoying our non-commercialized beaches, and so the mobile catering trucks have become very popular in these areas, setting up each morning, and breaking down each evening, leaving the beach still natural. King Kong Burgers & Hot Dogs. 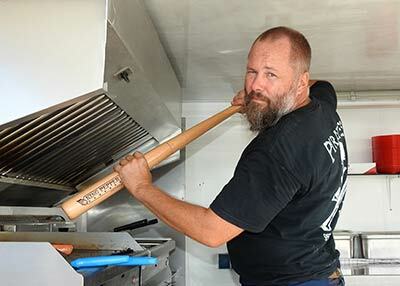 The latest in the mobile catering trucks is King Kong Burgers & Hot Dogs. 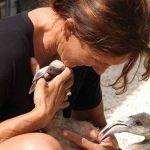 Run by Asko and his wife, they are located at Bachelor’s Beach, just south of the airport, every Tuesday through Saturday from 11:00 AM through sunset for lunch, snack-time, or an early dinner before heading home from a day at the beach. To find them, just be on the lookout for the big logo of King Kong. The Menu is Simple: Burgers, Fries, and Dogs! Asko adding pepper to the dogs–that is some pepper mill! Following the KISS principle (Keep It Simple! 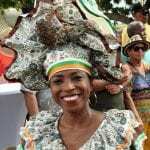 ), the couple has found a winning solution that nearly everyone enjoys. 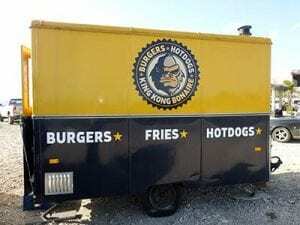 King Kong serves burgers, hot dogs, fries, and soft drinks. But that doesn’t mean the menu is ordinary! Quite the contrary. While visiting for the the first time, we got quite a few chuckles when reading the menu. Of course, there is the Bachelor Beach Burger, which can be had plain, with cheese, with bacon, or with jalapeno peppers, or all of the above. Then, there’s The French Connection Burger, with brie, onion compote, honey and nuts. Lastly, there’s the Italian Job Burger featuring truffle pesto, Parmesan cheese, and arugula. Two of King Kong’s hot dog choices: The Junk Yard Dog and the Chicago Dog. But the hot dogs have equally entertaining names with the Plain Jane (you get to guess what is on this one), the Chicago Dog (a classic), and, of course, the Junk Yard Dog with crispy bacon, cheese, hot peppers, onion compote, shoe string potatoes and home-made BBQ sauce. Yum. And yes, King Kong hasn’t forgotten how important the “sides” are. You can choose Just Fries, simply seasoned with Bonairean sea salt and your choice of sauce, the Mosquito Repellent Fries, tossed with garlic and parsley (editor’s note: I wonder if that garlic repels more than just mosquitoes! ), and the Truffle Fries, which are tossed with a truffle paste. Each week or so, King Kong will also feature a special, and when this reporter visited, we were eyeing the Blue Funk Burger, served with blue cheese, bacon, jalapenos, and onion compote. The specials are going to make excellent reasons to return every once in a while to try out all the different options. King Kong is Styrofoam Free. But now that I have made you hungry, let’s talk about an important subject: You won’t find a lick of Styrofoam anywhere at King Kong. If you are eating at Bachelor’s Beach, your food is served in re-usable plastic trays, lined with recyclable paper. If you are taking your food away to another location, it will be served in recyclable paper bags. King Kong is operating in an environmentally friendly manner. In summary, if you are heading south for a day’s diving or kiting, it’s no longer necessary to plan on packing a lunch. Just stop by and say hello to ol’ King Kong! I had the Bachelor’s Beach burger with bacon and cheese. Wow, now that is a tasty burger!